Many of the Greenville College Track and Field coaches have labeled Jarrid Williams as one of the hardest workers on the team. Williams is a fantastic jumper and student athlete who puts in the necessary work each day to be successful. That’s why it came as no surprise when Williams placed seventh in the NCAA DII Indoor Nationals in the long jump on March 12 in Iowa. “It is always great to see hard work pay off,” head coach Brian Patton said at a team gathering. Williams competed well in the long jump by making some wonderful jumps of 6.91 meters and 6.94 meters, which translates to 22’ 9.25”. His best jump was his personal record. Jarrid Williams and Coach Easley at the Division III Nationals. Image from Jarrid. The All-American honor for Williams is the second of his career and for the track and field team of Greenville. His other honor was when he was a member of the 4×100 meter relay that also took seventh at last year’s NCAA Division III Outdoor National Championships. 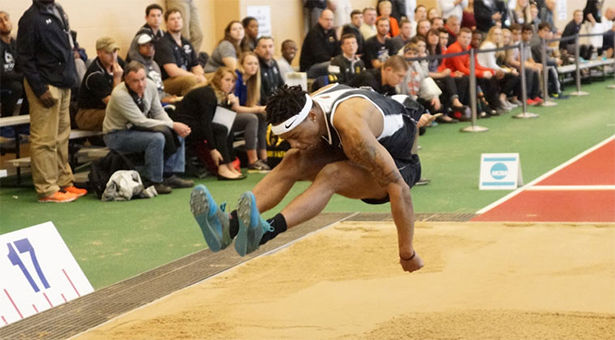 Williams is the first male long jump athlete since 2004 from Greenville College to go to the NCAA Division III Indoor Nationals. He is also only the second athlete ever from Greenville to compete in the long jump at the indoor nationals. The other athlete from Greenville College was Danny Donaldson, who placed third twice in 2003 and 2004 at the Division III Indoor Nationals in the same event. 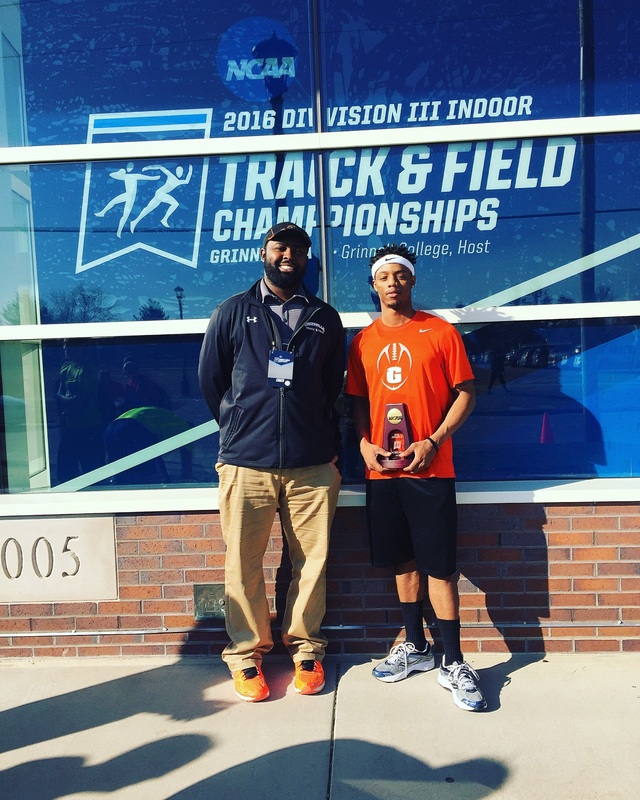 It has been a great experience for Jarrid Williams and Greenville College at the 2016 NCAA Division III Indoor Nationals. If you work hard like Williams has, you will see results in the long run for yourself. Don’t give up and keep working hard!